Take a flight down the coast to Dangriga in southern Belize, where you will be able to soar above the Mayflower Bocawina National Forest on a 12 platform zip line. 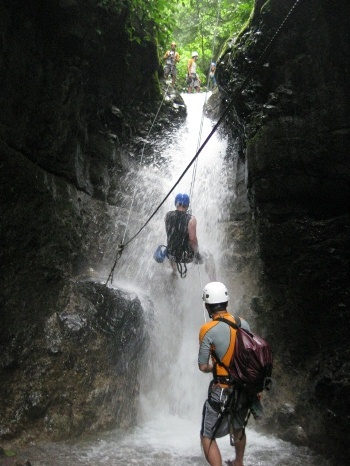 It has the longest, fastest, and tallest runs in Belize, and allows an up close view of pristine rainforest. After a quick lunch, take a short jungle hike to cool off at Bocawina Falls. Swim in its refreshing pools or rappel down its face for an even more unbelievable experience. For adrenalin junkies, an optional upgrade of rappelling down Antelope Falls is available on arrival at the tour site. The zip line is the only one currently certified in Belize by the ACCT and experienced guides will ensure a great experience for every age and skill level.